I have found that that in order to have equity in education, we must create it. Our society, not to mention our educational system, is not set up to be equitable. 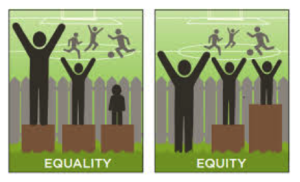 As leaders in education, it is our duty to establish an even playing field or at least to allow everyone to see the playing field as depicted in the depictions of equity and equality below. History teaches us that everyone should get the same things in education; rather, I believe that our students should first have access to the same opportunities regardless of their circumstances, in order to create the equitable playing field. 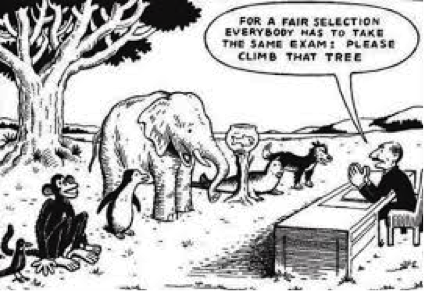 Another great image that illustrates the challenges we are up against in education is depicted in the cartoon below in which a variety of animals are given the task to climb a tree in order to be “fairly selected” for something seemingly meaningful. The image speaks for itself in terms of the unfairness in education. Hip-hop artist, Prince Ea brought this cartoon to life, from the perspective of the fish, with this video, in which he sued our educational system. First, we need to be honest with ourselves about the assumptions and beliefs that we as educators have of our students. Assumptions and beliefs based on preconceived notions misguide our judgement of our students’ potential. Dismantling the barriers that block our understanding of the truth, allows us to foster meaningful relationships with our students and colleagues to create culturally relevant pedagogical systems for teaching and learning. Building trust is step one in the process of creating equity in education. As principal of a school that focuses on social-emotional learning I have learned the value of intentional conversations with other educators about what it is that makes the school different and unique. Recently, I have been spending a lot of my time helping people understand the perspectives of other peoples. The results have been staggering: Personal connections across professional lines have strengthened. Understanding of our students’ life situations have grown. Ultimately, our relationships with students have deepened to the point where daily class meetings are forums for building trust among students from a variety of multicultural perspectives. Empathy for diversity is powerful in the pursuit of equity. Next, I have learned to surround myself with like-minded individuals in education. While having honest and intentional conversations is the first step in creating equity, having the courage to confront the people who lack an open-minded approach is the next leap. We need to challenge people who perpetuate a negative view of their students’ potential that is based in preconception. No single educator can do this alone. I believe in empowering all those who demonstrate even a sliver of confidence to stand up to the injustices they see. Staff diversity increased from 2% to 20% teachers of color. Annual school suspensions decreased from 58 to 16 over the course of three years to the point that suspensions of students of color and with disabilities became proportionate to th school demographics. The percentage of students reading on grade level skyrocketed from 64% to 84% over two years. Potential became a reality. Innovation is the final step in creating equity in education. We created a resource center called “The Empowerment Zone.” All our school resources for students, parents, teachers, and community members are centralized in one room for easy access to supports. In The Empowerment Zone, our 36 community partners provide resources and services including academic, mental health, financial, and wellness opportunities. The reality of the equal playing field described at the beginning of this blog came to life in The Empowerment Zone, where all of our students and their families have access to the same opportunities. Moving forward, I believe in the need for “A New Angle” on structuring our educational system. The process takes intentional and honest teamwork with the willingness to have courageous conversations about our differences. We must empower our educators who have an open-mind attitude toward students and who believe in making a difference in all of their students’ lives. Ultimately, we need to create a context that allows innovation to thrive in a world of inequities. Our educational “playing field” needs to become level where “climbing trees” is no longer an unfair expectation for success.